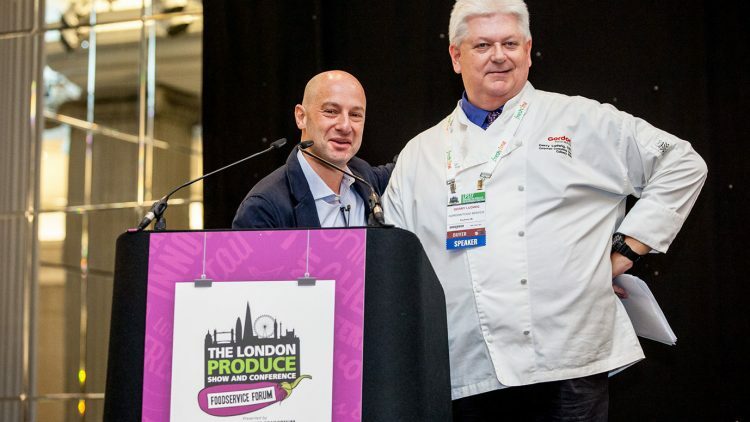 I was lucky to be a speaker on a panel at the London Produce Show and Conference recently and I learnt about a new trend called veg-centricity. A hugely informative event with a wide range of speakers and topics and some strong themes stood out for me. I took away far too many ideas to fit into one blog. However, if I have to pick one big idea away from the event it was the growth in plant-based protein dishes discussed by Gerry Ludwig, food writer, speaker and trend tracker from Gordon Food Service. I will definitely use this to inform our food development team’s thinking on our new grab and go range. Gerry surveyed the most happening restaurants from Chicago, New York and Los Angeles to look at the very latest food concepts. What caught his eye was the explosion in veg-centric dishes eaten by omnivores, which is not the same as vegetarian food. Veg-centric dishes are all about culinary technique; amplifying flavour with high-heat cooking methods like charring, oven-roasting and wood-grilling, and often featuring protein additions, like chunks of crispy Iberica ham. With some research suggesting eating more plant-based protein and less meat can help you live longer, it seems that vegetarian protein sources are more popular than ever. This change in customer appetite coincides with the drive for us to produce more sustainable food. We will need to rethink our relationship with meat very soon, one billion people already do not have enough to eat and we will need to feed another three billion more people within the next 50 years. Meat production is also a very energy consuming process. Estimates calculate that the combined climate change emissions of animals bred for their meat is anywhere between 18% and 50% of the global total. This is more than cars, planes and all other forms of transport put together. Not to mention the water and waste implications of meat production. This isn’t intended to be a lecture, more ‘food for thought’- pun fully intended. Gerry and his team visited over 1,200 restaurants, they worked (ate) their way through the menus (it’s a tough job but someone’s got to do it!) and they interviewed the staff to gauge customer feedback. The result of this is that they identified veg-centricity as a macro trend, this is defined as an over-arching trend that plays out over a long period of time. Gerry believes veg-centricity is in its genesis phase. He observed that vegetables are now ‘COP’ which means centre of plate, these are not meatless dishes but ones that are targeted at the vast majority of diners who are omnivorous but want more compelling flavours. Flavour amplifiers included; anchovy, bagna cauda, Iberico, prosciutto, nduja, meat ragouts, lap cheong, lardo, salami & sopressata, bacon & pancetta, katsuobushi, meat broths, dashi and fish roe. For veg-centric inspiration look at Gjelina in Venice, California, Vedge in Philadelphia, Hearth in NYC and Roister in Chicago, their care of produce is as meticulous as it is with protein. ‘Nose-to-tail’ becomes ‘root-to-stem’, and waste including carrot tops, parsley stems and watermelon rind are used to build layers of flavour For ideas of this concept look at Dirt Candy in NYC. We learned about the ‘Impossible burger’, it’s a vegetarian burger that bleeds. The burger is served with caramelised onions, lettuce cheese, pickles and mixed greens. It is meat-free and made of wheat, potato, protein, coconut fat and a plant-based protein molecule called heme. The target audience is not vegetarians. It’s aimed at meat eaters who want to eat less meat. Gerry shared the Viva la veggies report produced by Technomic. They surveyed 305 US operators, both commercial and non-commercial to get a sense of how veggies are being used, how they are viewed, and menu trends. The main outcome was that customers are increasingly more health conscious and are demanding better-for-you choices, this also ties in to sustainability. Animal and plant proteins can work together, it’s not a case of either/or. Vegetables are no longer the support act, they can be centre stage and for caterers it’s about moving beyond a ‘meatless mindset’. Veg-centric dishes can be a doorway to new ideas. Jason Danciger from Sushi Gourmet hosted the day and also shared his insights about the growth in veggie sushi. And Karen Fewell, who spoke later in the day shared this pearl of wisdom, ‘evidence shows that when vegetable dishes are segregated and boxed customers are less likely to choose them’. If you want to encourage your diners to eat more veg-centric dishes then mix up the menu and let them be the hero. Our Chef Director, Pete Redman was on a panel too, discussing the chefs’ challenge to meet the trend for plant-forward foods. Thank you again to the London Produce Show and Conference for teaching me about veg-centricity. I am already looking forward to next year’s inspiring programme.